Dinners and social events have been a long tradition of College life. In the College archives there is a dinner book which describes many of the magnificent dinners attended by Fellows and Members and their guests. Before the move to St Vincent Street in 1862, the annual Faculty Dinner was held in a local hotel. In 1855, for instance, the dinner was held in Mr James Carrick’s Royal Hotel 66 George Square, Glasgow, the cost for 26 being £27.6s.0d. 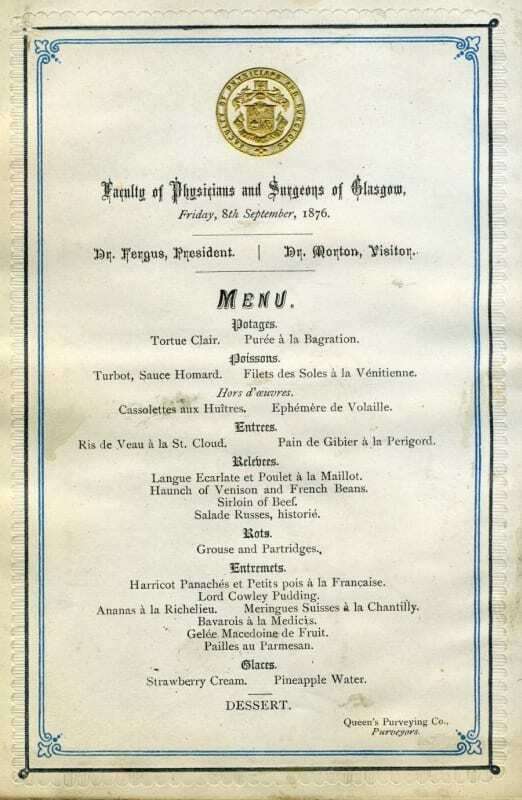 With the move to 242 St Vincent Street, the Faculty could dine at home and a Dinner Book covering the period 1865-1932 records the menus and “Names of the Gentlemen Invited to the Annual Dinner”. The dinner held on the 9th October 1865 merited an article in the local newspaper which has been duly cut out and pasted into the Dinner Book. 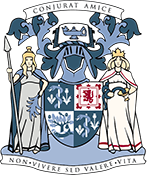 The dinner, described as a “banquet” was attended by 38 Fellows of the Faculty and guests and included a range of city dignitaries including the Lord Provost, the City Chamberlain, the Dean of Guild, the Deacon Convenor of the Trades House and the Dean of the Faculty of Procurators. Following a “sumptuous dinner”, numerous speeches and toasts were given. The President, Dr Fleming, in his toast of Flores res Medica, declared that: “Probably at no date since the days of Hippocrates has there been a more practical improvement to medicine and surgery than since the beginning of the present century”. The earliest menu in the Dinner Book is that of the annual dinner of 29th November 1871. The Fellows and their guests dined on a wide variety of fish and meats including Oysters au Gratin, Lobster a l’Indienne, Cutlets aux Petits Pois, Round of Beef, Saddles of Mutton, Braised Turkey, Pig’s Cheek and York Ham. The dinners continued in similar style as can be seen from the menu below from 1876. On this particular occasion, 34 Fellows and 30 guests attended at a total cost of £80.00. A menu for the Tercentenary Dinner of the Faculty has recently come to light during the cataloguing our bound pamphlet collection. 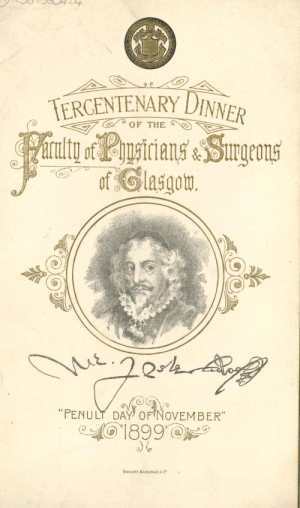 Held on the “Penult [penultimate] day of November, 1899”, the front of the menu contains an image of Maister Peter Lowe, the College’s founder, who petitioned King James VI of Scotland in 1599 in order that a corporation be founded for the maintenance of medical standards. A rich and varied menu was provided followed by the usual variety of toasts and the celebrations ended with the singing of Auld Lang Syne. The dinners would have been held in what is now known as the Alexandra Room in 242 St Vincent Street. During the early 1890s a large hall was erected behind 242, designed by the Glasgow architect J.J. Burnet. 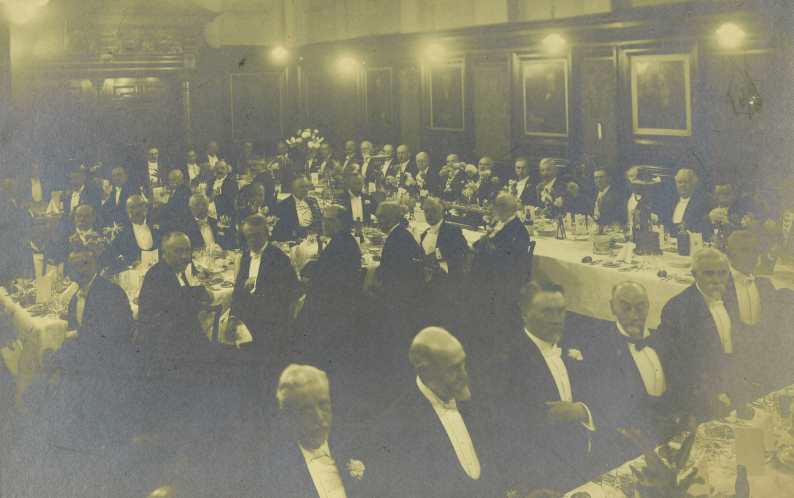 The Faculty really could now dine in considerable splendour as can be seen in the photograph below, dating from around 1914. Nowadays, dining within the College is not just restricted to Fellows and Members. 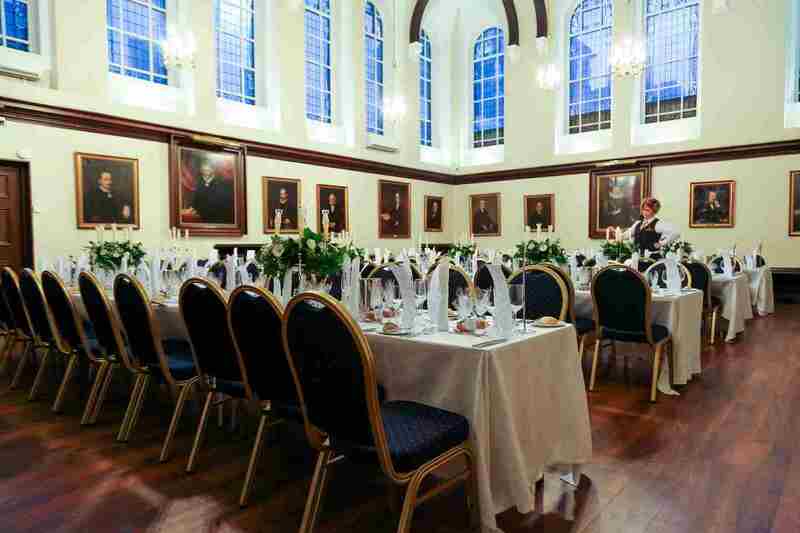 College Hall is used for corporate dinners, banquets, balls, and weddings as well as conferencing and exhibitions. The room accommodates up to 100 guests for dining and entertaining. College Hall set up for a present day banquet. 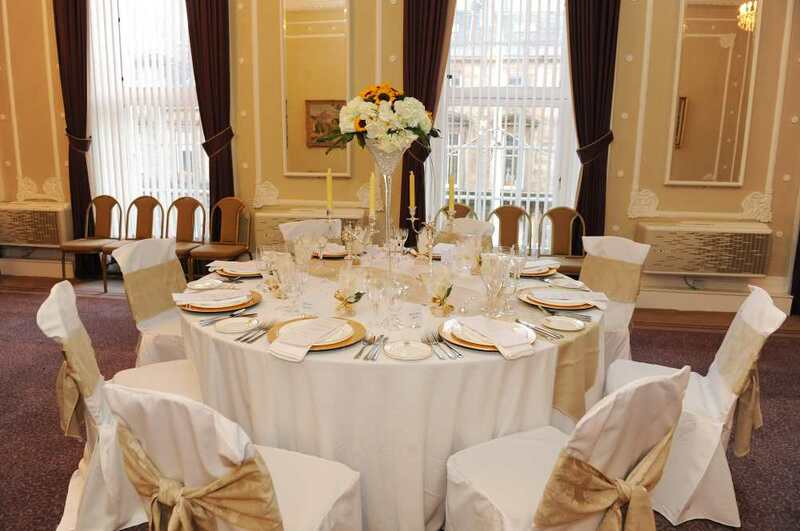 The elegant Alexandra Room, which was first used as a meeting hall, can accommodate up to 50 guests for dining. The food is as sumptuous as in previous years (although thoroughly designed for modern tastes) with a wide variety of menus. If you are interested in using the College as a venue then please contact Fifteen Ninety Nine or view the Fifteen Ninety Nine website.